i just wanted you guys to know, that I'm now on dreamwidth too. I'm not going to delete my LJ cause you know (icon community and other fannish interests and all that) however, I also did want to back up all of my entries and icons incase LJ ever went down. I will continue to use my LJ for fandom stuff and use dreamwidth for all my personal stuff. On dreamwidth, I am applepips and my icon community is inkblush. Please let me know your usernames, so that I can add you there! And feel free to add me as well. 25. 27. Pips. Of the female persuasion. Lover of all things fluffy. Is a slave to her wage. Make-up fiend. Book fiend. Day 02 - Where I'd like to be in 10 years. Obviously I'd like to be financially secure, with a roof over my head and enough food to eat and clothes on my back. Other than that, I hope that by then I'd have at least gotten one book published, been a few places around the world, live with all the pets I ever wanted and maybe I guess be with someone who I adore. And it goes without saying, happiness and contenment. meme stolen from ionizable because gawddayum, its been a long time since I did one. 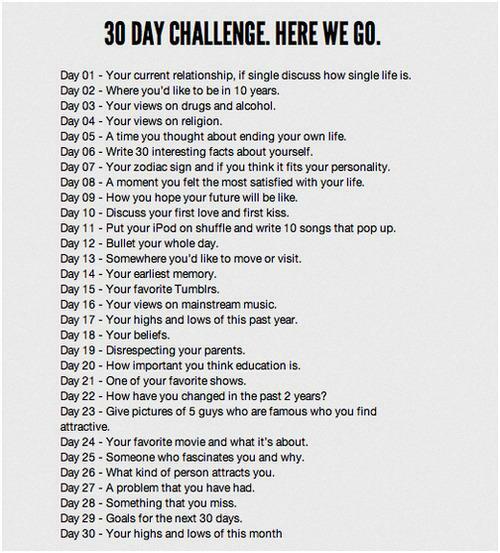 Day 01 - I am single as a solitary pringle. Always have been up until now. Never dated, never made out with someone, the whole shebang etc. I did get asked out on a date once but I did not like the dude in question so I told him I had an exam. He suggested another time and day after my exams were done but I prevaricated because I refuse to go out with people who do not make me feel comfortable and this chap, who was my next door neighbor by the way had this knack of making me feel supremely uncomfortable. That was way back in the 12th grade. The thing is I studied in a all-girls Catholic school and a all-girls Catholic convent. So as a result, I didn't learn how to interact with people who were not ladies and I was absolutely terrified of dudes. I couldn't even look them in the eye, let alone say a word or two to them. But when I went on to do my post-grad, I decided it was time for me to pull-up my boots and get to interacting. The first few months, I was floundering but after that I managed and now I can look a dude in the eye and talk and have two excellent dude friends. Ooh, and postgrad too was where I developed some serious crushes (one only and lmao, I remember once me and friend were hiding in the bushes and checking this dude out.). I never made them progress beyond the point of a crush though because, one - no guts, two - or rather more importantly, I realized I do not do casual. I'm either all in or all out. I tend to be more invested than the other person and that way only lies to disaster. Okay, I have been living under a rock. For shame, fannish self, FOR SHAME. I mean, I knew vaguely that Community was supposed to be premiering somewhere in Oct/Nov and today I realized I haven't seen the newest episode and I was all, "GASP, I AM TERRIBLE FAN" and I checked out wiki and it's premiering in FEBRUARY OF NEXT YEAR. Fine, I told myself I would deal. Then I read, CHEVY CHASE LEFT. NO MORE PIERCE???? I know, Dan Harmon left, I havent been so out of it, BUT STILL. ;_; Also, I know Pierce wasn't the bestest but it was still fun and they were dysfunctional group who were buds and blarghhh. And he and Shirley would get up to side shenanigans too! I'm sad that the show is getting all thrown around AND that my fannish self is receding. TIME TO BRING IT BACK OUT. My fanart and mix for au_bigbang. I chose the fic, Phoenix Hours by musyc@dreamwidth.org. Author Notes: I ambitously signed up for the AUBigBang. Guess what? I managed to finish too. :DD Sure, I just threw myself headfirst into a fandom I dont know very well but hey, let's focus on the positives right? Nerves aside, I hope I did this okay? Please forgive me for any character inconsitensies, I tried my best. Hope you like! Also, do do check out the lovely art and the mix by the fabulous dwg for this fic. (IT'S SO AWESOME A GIRL COULD CRY. :'). THERE IS A REALITY SHOW ABOUT CAKES. It's like God answered my prayers. Or the TV people got into my brain and stole it. Cake + Reality Show = TEARS OF JOY (ME).